THE MOON HOAX : Is The Myth still alive - 44 years on? If you are one of those folks who still believes that men landed on the moon back in 1969, please take a little time reading this concise exposé as to why I do not believe so. I won't overwhelm you with data and details which you may have already come across perusing the many sites questioning the Apollo landings. I'll just keep it simple - while 'teasingly' proposing your brain to interact with a mostly photographic, logical, no-nonsense approach to this whole affair. So here we go. Well, how many of you have seen the longer version of this clip? For some unfathomable reason, Buzz decides to jump UP again on the ladder. Then, at about 1min into the clip, we see a silhouette that must be meant to be Neil Armstrong emerging out of nowhere - aimlessly hopping around Buzz's back! Here's another 'transparently' fake film sequence. 1- Do MOST people believe in this? 2- Why does ANYONE believe in this? This is an Ockham's Razor-type issue. If you can't tackle it due to limited photographic knowledge, that's ok - I will fill you in: as it is, there is simply no alternative description of this other than that what we see here is a poor celluloid film montage - the sort of which was used back then, way before Photoshop or any other slick digital imaging-software was available. Of course, you may question my competence in this field (remember, I wish to keep this article simple and free from technicalities). In this case, however, it is up to you to find any credible experts of your choice and submit them this simple, straightforward question: "WHY do these astronauts appear to be transparent?" So please select any photographic/ cinematic expert of your choice. If this expert tells you it's a quite legit and authentic film clip, you will then have to process this 'expert explanation' (to a never-seen-before-phenomena)- and evaluate its credibility with your own brain. Yes, at the end of the day, it's all up to you. You are free to believe that the above images are real - although you might wonder why they are, objectively speaking, so very strange. 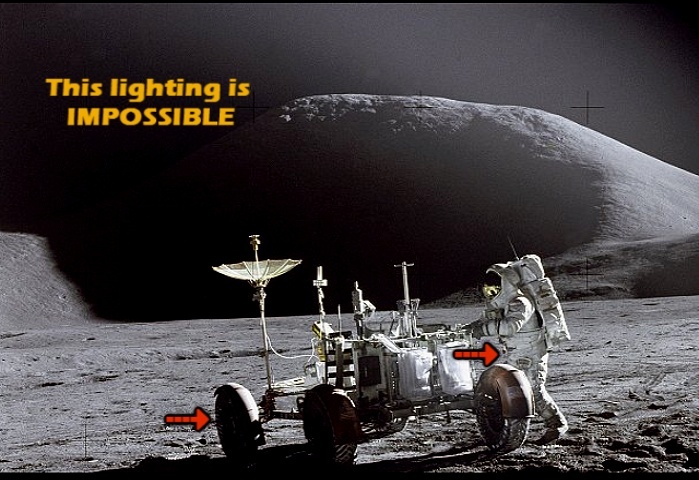 It is your choice to believe in the reality of this Apollo 11 imagery - but your brain should tell you that this belief is nothing but a matter of faith - much like the blind, unquestioning faith that many cults and religions require from their followers. This mother-of-all-media-hoaxes paved the way to what we have today: a continuous string of fraudulent TV imagery - designed to control and dumb down this planet's population. It is high time to understand this - unless we are to be completely led into dupe-land by the so-called "powers that be"(or as I like to call them, "The Nutwork"). It is high time for sharp and honest people to wake up to this simple fact: TELEVISION is the current Weapon of Mass Distraction. Switch it off now - and switch on your brains - if you haven't done so already. Better late than never, don't you think? PLEASE KEEP IN MIND THAT ALL THE BELOW IMAGES WERE UNEXPLICABLY RELEASED IN THE 1990'S - OR LATER. 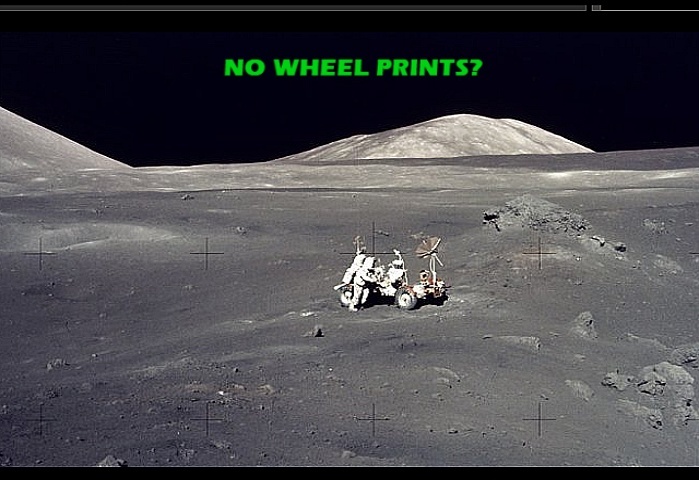 Here is the (in)famous "Moon Rover" in the middle of a moonscape. How did it get there without leaving wheelprints? 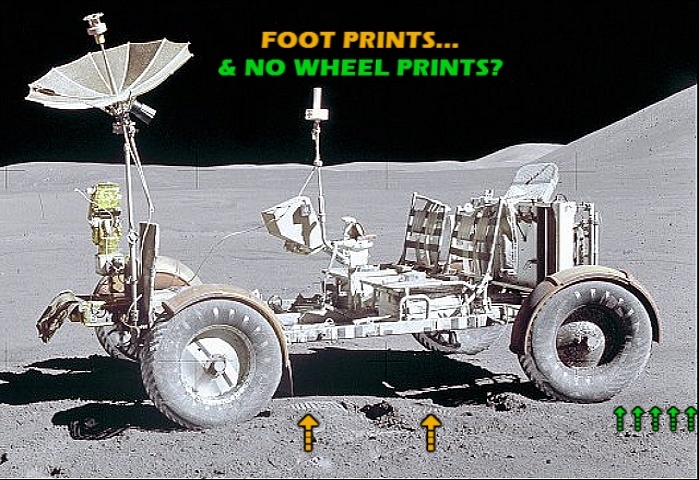 Ok, so naysayers will say: "THE MOON-SAND WAS SO COMPACT THAT IT DIDN'T LEAVE ANY VISIBLE WHEEL/OR FOOTPRINT". Well... NASA supposedly now has (since 2009) a "Lunar Reconnaissance Orbiter(LRO)" circling the moon which is allegedly "mapping the moon surface". Here's what they claim: "The probe will make a 3-D map of the Moon's surface and has provided some of the first images of Apollo equipment left on the Moon." 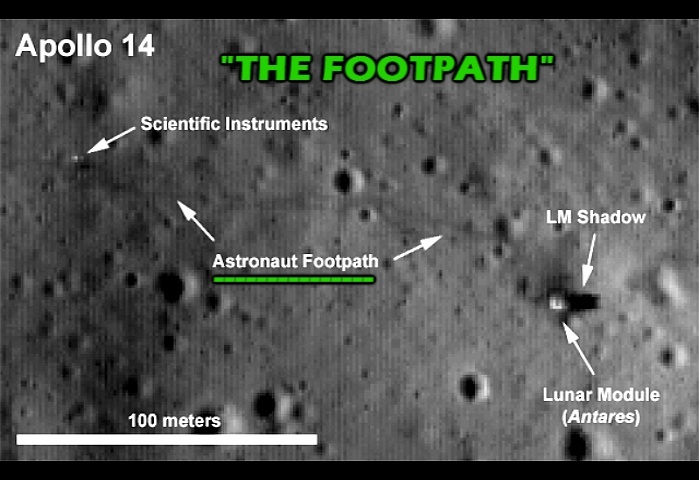 So, if 'astronaut footpaths' can be seen from this distance - why can't we see any "Moon Rover" wheelprints?? This other NASA picture shows an "Astro-naught" with an American flag. All I have done here is a simple, gradual contrast change of this photograph. A strange shape is revealed in the background. Do I know what it is? No - but it simply proves beyond any shadow of doubt that this is a manipulated photograph. 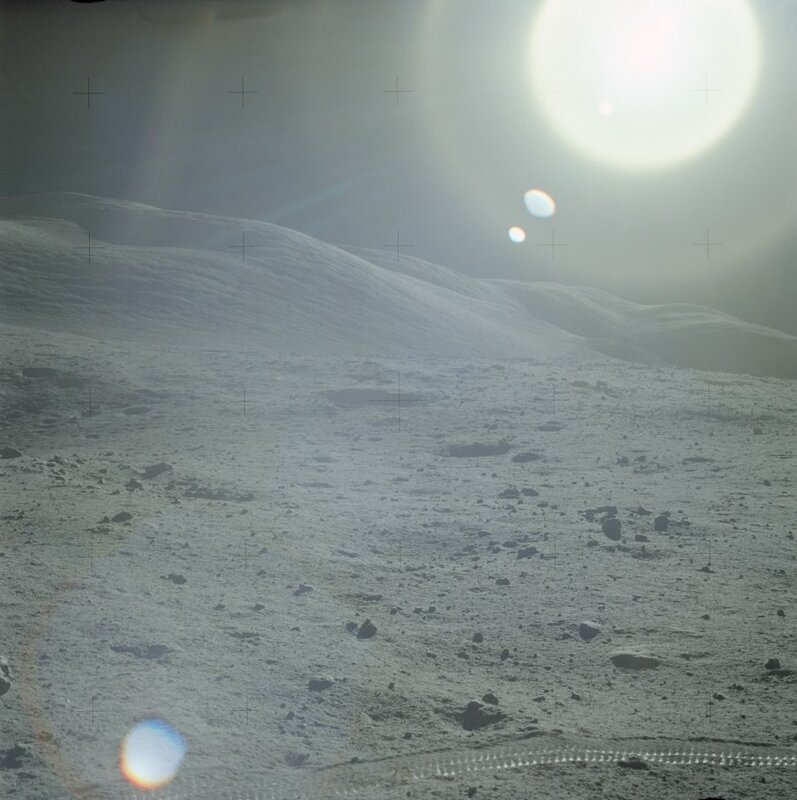 When was the picture WITHOUT the Lunar Module taken? BEFORE or AFTER the Apollo15 visit to the moon? I don't know about you - but I laugh wholeheartedly everytime I watch these two clips. At the same time. I feel genuinely sorry for the people who keep believing in this utter farce - now well over 40 years after it was concocted and sold on TV by the silly NASA pranksters. Does this old, global hoax still matter? That is up for you to decide. You are, after all, the captain of your own brain - and you are still (in principle) wholly free to steer your ship in any direction that you desire. Ultimately, we owe it to this planet we live upon (and to its beauty and inherent intelligence) to uphold its sanity in the face of those who wish to subvert our minds for their own profit and social control. This has got to be the simplest, most logical way of convincing any stubborn NASA-believers that the Apollo program was a hoax from start to finish - and from the word go. If this won't do it, nothing will : such people may not even wish to be helped exiting their fantasy world. Thankfully, there is still intelligent life on Earth - sooner or later it will have to prevail. 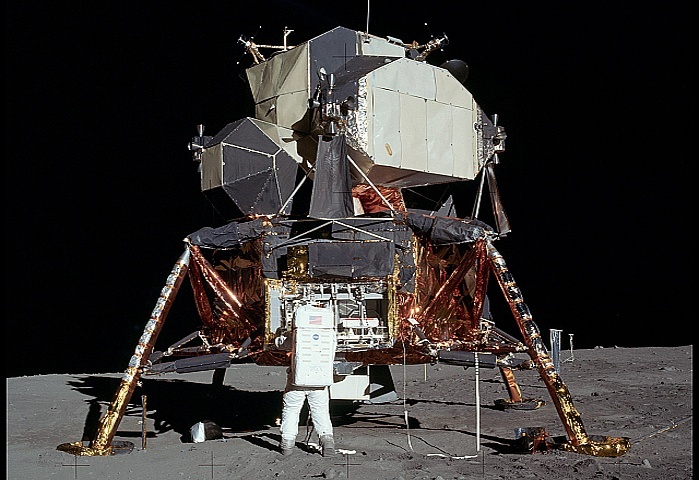 NA$A can has 110-page document proposal to cover entire $6.9 Billion Apollo LEM program. "10 other programs of similar size; like the C5A, large submarine orders, or aircraft-carrier orders, all of the proposals were between 5,000 pages & 86,000 pages; with an average of 36,000 pages. And yet we see this one, standing there all by itself, at 110 pages. And it appeared to be, to me, that this may have been a situation where they knew that if anyone checked, that someone would say "well, in order to win this, you had to submit a proposal, right? so let me see the proposal." So they had to produce a proposal, but they didnt go to the trouble of producing one of decent length. A 110-page proposal is about appropriate for a $1.4 million dollar program, which is X 5,000 times smaller than the claimed LEM program. Now you wouldnt need very much; a long proposal if you werent really going to build a LEM that really had to work. If you were going to be building LEMs that ended up in museums or on displays then you could probably do that for a few million dollars, and that might only require a 110-page proposal..."
Last edited by reel.deal on Sun Mar 25, 2012 5:03 pm, edited 1 time in total. The beauty of this venture of mine (attempting to alert my fellow earthlings to the massive hoaxes and deceptions we have all been fed with) is that the old, official documentations of the so-called 'cold war space race' are now my best resource to show how pathetically cartoonish the whole concept of 'space conquest' was in the first place. Here is a classic - produced by Walt Disney, for his good friend Wernher Von Braun. Enjoy! It all makes perfect sense, doesn't it?